Press the ENTER/SETTING button to show the Settings screen on the display. Turn the TUNE/FOLDER knob to navigate the options and then press the ENTER button to make a selection. Bass, treble, balance and fade can also be adjusted by pressing the ENTER/SETTING button and turning the TUNE/FOLDER control knob to select the item to adjust. When the desired item is shown on the display, turn the tuning to adjust and then press the ENTER/SETTING button until the display returns to the main audio screen. If the button is not pressed for approximately ten seconds, the radio or CD display will automatically reappear. Press the APPS button to launch the Smartphone Integration Mode. For additional information, refer to “NissanConnectSM with Mobile Apps” in this section regarding this feature. For additional information, refer to “Bluetooth® Hands-Free Phone system without Navigation” in this section regarding connecting your phone. When the XM button is pressed while the ignition switch is in the ACC or ON position, the radio will come on at the station last played. The last station played will also come on when the VOL (volume)/ (power) control knob/button is pressed on. *When the XM button is pressed, the satellite radio reception will not be available unless an optional satellite receiver and antenna are installed and a SiriusXM® Satellite Radio service subscription is active. Satellite radio is not available in Alaska, Hawaii and Guam. If a compact disc is playing when the XM button is pressed, the compact disc will automatically be turned off and the last radio station played will come on. Additional features For additional information, refer to “iPod® player operation without Navigation System” regarding the iPod® player available with this system in this section. 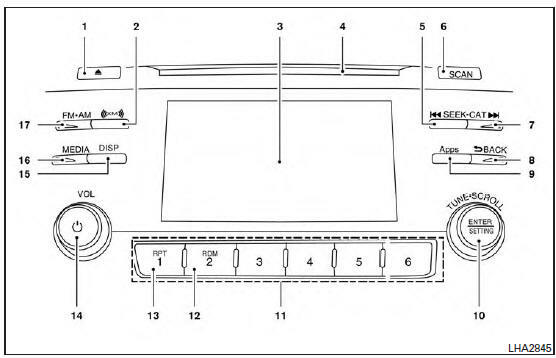 For additional information, refer to “USB (Universal Serial Bus) Connection Port (models without Navigation System)” regarding the USB connection port available with this system in this section. For additional information, refer to “Bluetooth® streaming audio without Navigation System (Type B)” about the Bluetooth® audio interface available with this system in this section.